April 30 is Hexennacht, also called Walpurgisnacht. It's the night before May Day and the old belief is that witches met the night before to party, wait for spring, and do witchy things. In Germany, it's also a night of mischief for some. I haven't noticed any signs of mischief in years past, but that's not say that there couldn't have been some. 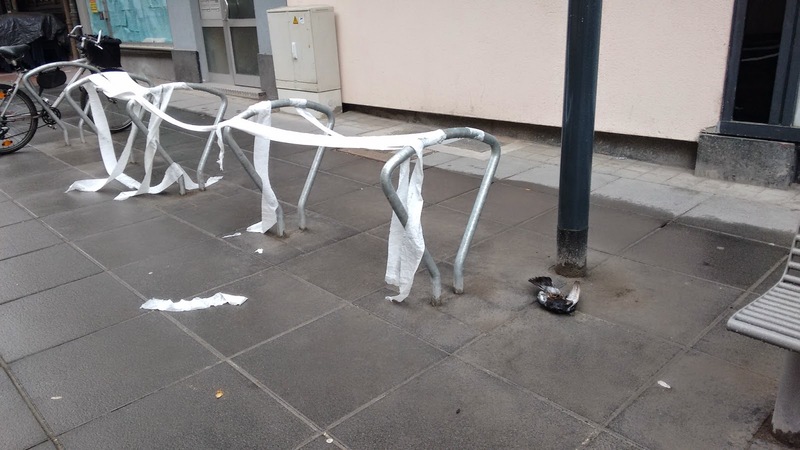 This year, I did see that someone had let loose with toilet paper and "decorated" some bike racks. There was also a dead pigeon next to it. I have absolutely no idea if it was meant to be part of the toilet papering or if it had already been there. Either way, it was disconcerting! Oh, I wish I could post here a picture of how my house was TPed several years ago by a group of my students in Wisconsin. Our Brazilian exchange student thought it was hilarious until she learned who had to clean it up (she had a maid to clean her bedroom in Brazil). That wasn't the smartest move! It is said that one's brain doesn't fully finish maturing until about age 22. It's no surprise, huh?